This book is another one of my favorites that was read to me in elementary school! 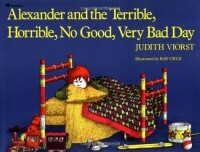 The story is about a boy named Alexander who is just not having a very good day at all. He woke up with gum in his hair, his best friend told him he wasn't his best friend anymore, and he got in trouble at school. These are all things that could happen to children any time. The book is very relatable to students and would be great for a writing prompt for older students on what their worst day was or how the make a terrible, horrible, no good, very bad day better.